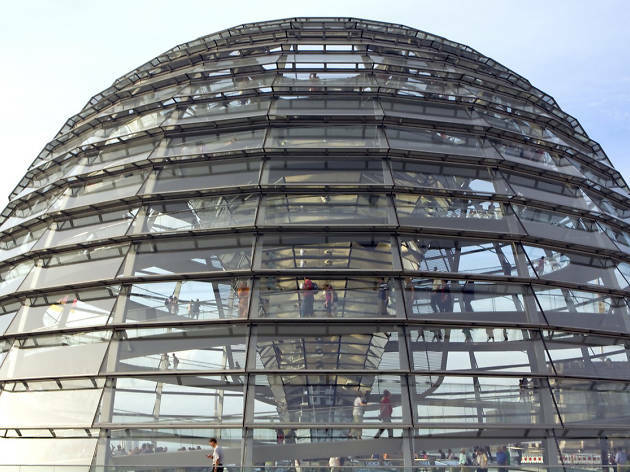 The Federal German Parliament was welcomed back from Bonn in 1999 with a new glass dome, a potent symbol of political aspiration, designed by British ‘starchitect’ Norman Foster. 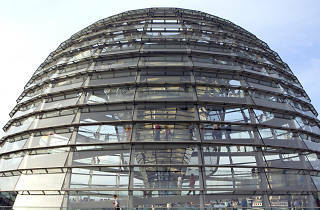 The Reichstag was built in 1894 to house the united German parliament; the terrible fire that was started there on 27 February 1933 not only gutted the building, but was used by the Nazis as a catalyst for withdrawing basic freedoms. Foster’s renovations aim to establish a ‘dialogue between old and new’. The glass cupola materialises aims for political transparency and is open to the public for tours to the heart of government. The dome, rising like a phoenix from the flames, sheds light on the governmental workings below, thanks to energy-efficient mirrors.